Charles Leslie "Chuck" Ross, age 92, of Cicero, IN died Thursday, January 25, 2018 at Miller's Merry Manor at Tipton, IN. He was born January 18, 1926 at Arcadia, IN to Edward Richard and Gladys (Lacy) Ross. 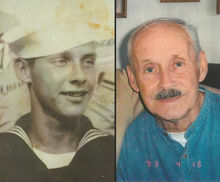 After his schooling at Arcadia Schools, he served his country in the U.S. Navy during WW II and the Korean War. Coming home from the wars, he became employed at Delco Remy as a machinist where he worked for over 30 years. On July 6, 1946 he married Rachel Ellen (Mayfield) Ross and together they enjoyed 72 happy years. She survives him along with their three children: Teresa (Terry) Dunn of Arcadia, IN, Denny Ross of Cicero, IN and Bobbie (John) Shelton of Cicero, IN. Additional survivors include grandchildren: Dan (Joy) Kerfoot, Todd (Chanda) Kerfoot, Jake Kerfoot, Landi Shelton, Zac Shelton, Levi Shelton, Andi (Josh) Raffanti, Erin (Nick) Arnett, Derek (Gwen) Dunn and Michelle (Duane) Parsons, 11 great-grandchildren and 1 great-great-grandchild. Chuck, as he was fondly known, was a member of the Cicero American Legion, Cicero VFW, Noblesville Masonic Lodge, Indianapolis Murat Shrine, Indianapolis Scottish Rite and Jobs Daughters. Chuck was a people person and loved interacting with others. He loved family get-togethers and would entertain his kids and grandkids with interesting stories. Often he would walk the woods near the family home and would bring his beloved wife, Rachel a bouquet of wild flowers. Chuck loved going to antique shows and garage sales with his favorite collectible item being pocket watches. Funeral services are scheduled for 1:00 P.M. Tuesday, January 30, 2018 at Hartley Funeral Homes Cicero Chapel, 209 West Jackson Street, Cicero, IN 46034, with Scott Miller officiating. Burial will follow at Cicero Cemetery. Visitation will be from 11:00 A.M. until time of the services. Memorial contributions may be made to the Alzheimers Assocation, 50 East 91st Street, Suite 100, Indianapolis, IN 46209-4830. You may send condolences at www.hartleyfuneralhomes.com. Add Photos, Videos, Music that tell the story of Charles' life.